Traffic on the Circle has been bad for decades…and it’s only gotten worse. 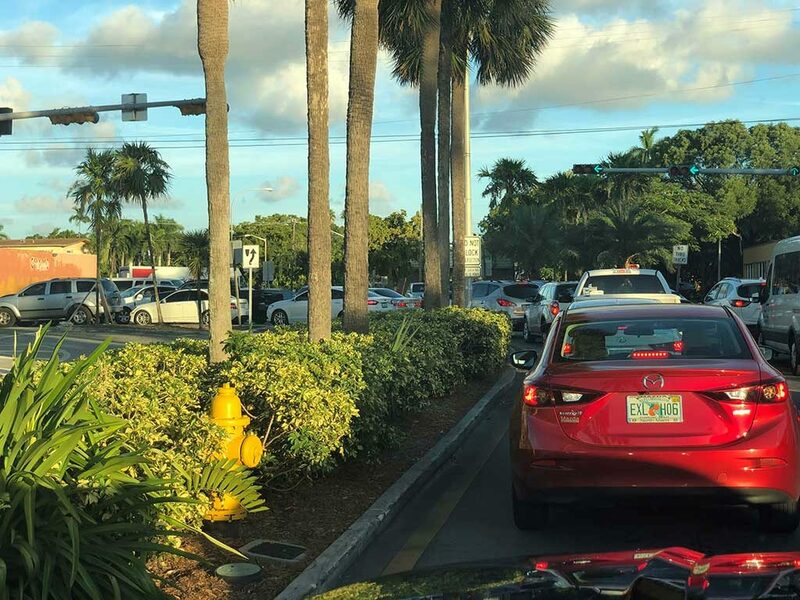 The explosion of jobs and population in Doral has only exacerbated the amount of traffic that cuts through Miami Springs via Curtiss Parkway, the Circle, and Hook Square. 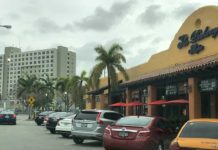 And with the recent increase allowing 70% greater downtown development, more density in Hialeah, and continuation of development in Doral, traffic is sure to only to get worse. So we’d like to start a conversation about solutions. 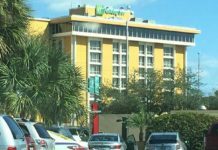 What options do we have to improve traffic in Miami Springs? Below, we’re presenting a few options, but this is a community conversation. 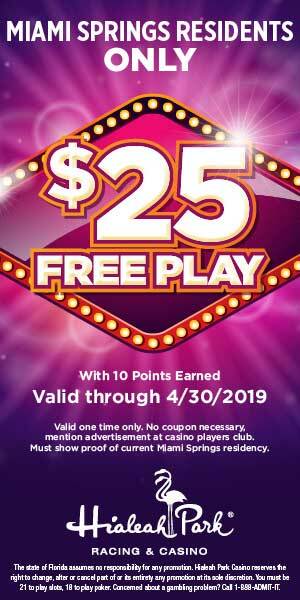 We want to hear what you think. We want to get your input. We feel that when everyone pitches in and ideas are shared and debated, we’ll get the best options for the community. 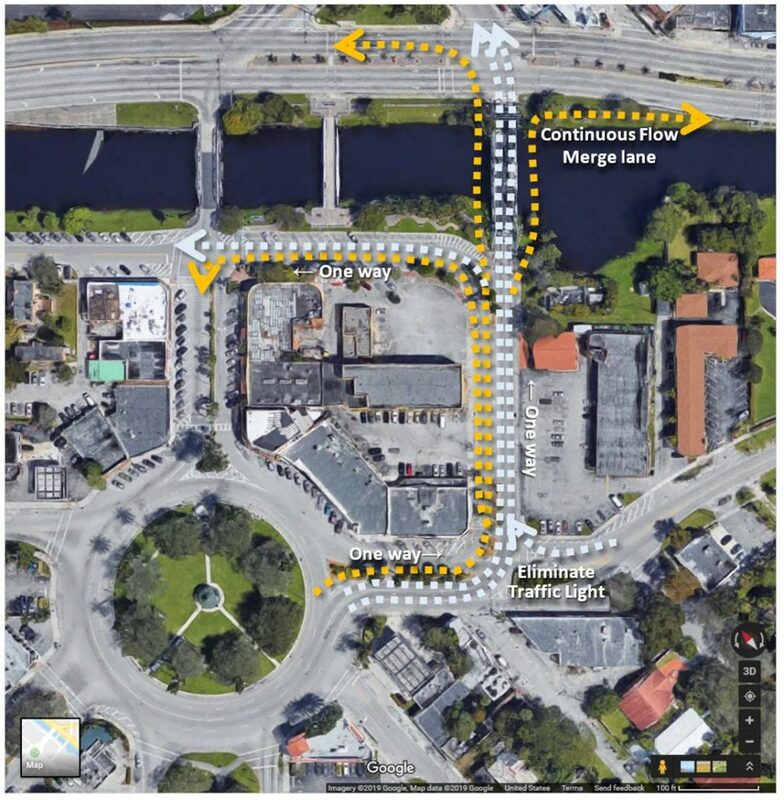 Below are some of the options Miami Springs has to improve traffic on the Circle. By no means do we think these are the only options. We ask that you comment below or on social media and share with neighbors to get a variety of ideas to improve traffic in the city. Furthermore, we believe we don’t have to wait for government to come up with the solution. Instead, why not have the community come up with a solution we all like and then present it to the government. I think we’d much rather see that than a plan forced upon us none of us ever really liked in the first place. The status quo requires no action whatsoever. This is the path of least resistance which is what all the councils have done for years. Nothing. Of course, this option only guarantees more and more traffic backing up on the Circle and onto Curtiss Parkway. This idea has been around for about as long as we’ve had traffic. The fact is tolls are not allowed on these county roads. Tolls are for expressways and highways and not used to deter traffic from communities. Tolls restrict the free movement of people and commerce. Nevertheless, I’m convinced that this idea will never go away. 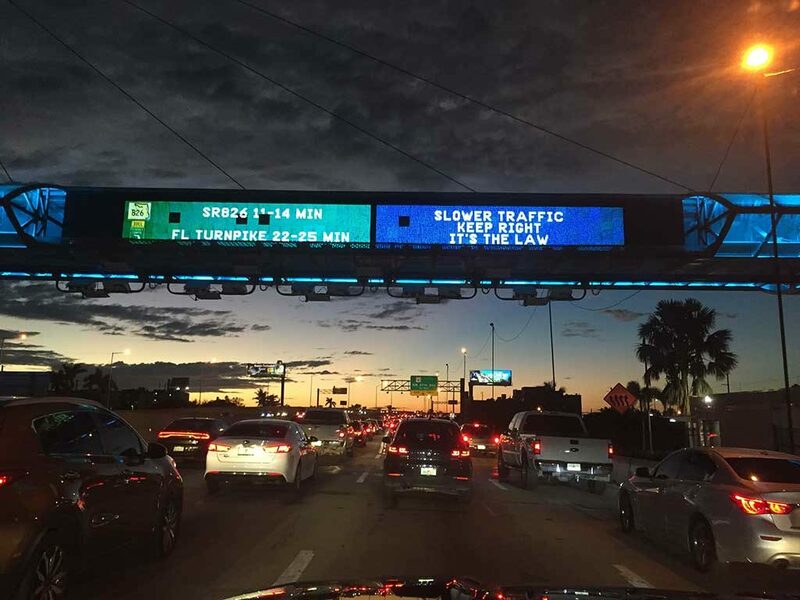 And I’ve seen it argued that people want the tolls to be paid by everyone else except Miami Springs residents. More importantly, the tolls do not address the real problem that causes traffic on the circle. More on the root of the problem below. This idea has also been thrown around for years as a way to reduce cut through traffic. This is another idea that will not happen (with the exception of a natural disaster that were to wash away the bridges). We need those bridges. 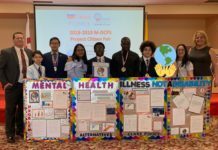 We need access to Hialeah. If we were to close those bridges, we would only exacerbate the traffic on East Drive. Can you imagine how long it would take to get into Hialeah if all the traffic were diverted to East Drive? How long would it take to make a simple trip to CVS and back? It gets bad now. It would only get worse if we closed the bridges. The options listed above don’t get to the root of the problem. The source of the traffic trouble is the bottleneck that happens on the Hook Square Vertical Lift Bridge. There are only 2 lanes of traffic. That was probably just fine in the 60s and 70s. Going all the way back to the late 80s, I remember getting stuck behind that bridge for several light cycles. That was back in the 80s. 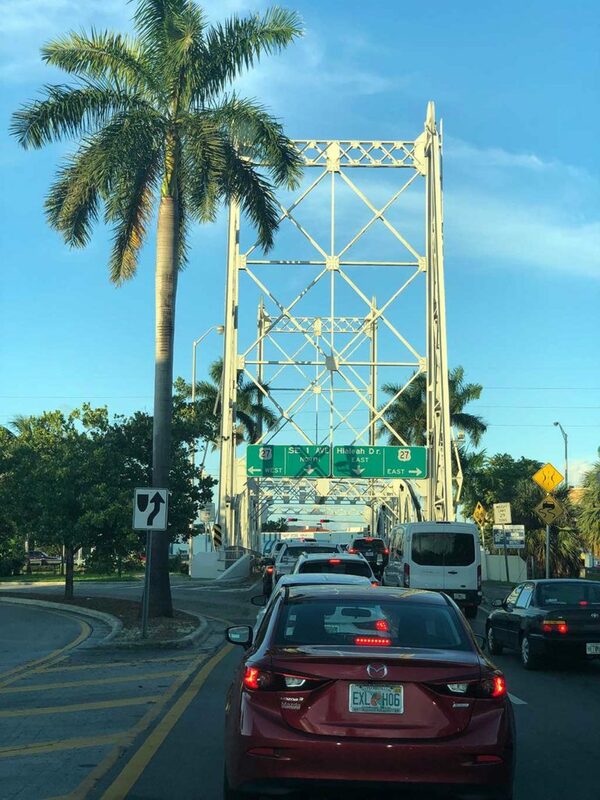 Today, with the increased population and traffic, it’s just obvious that Miami Springs has outgrown the 2 lane vertical lift bridge. Wait a second. We love that bridge. 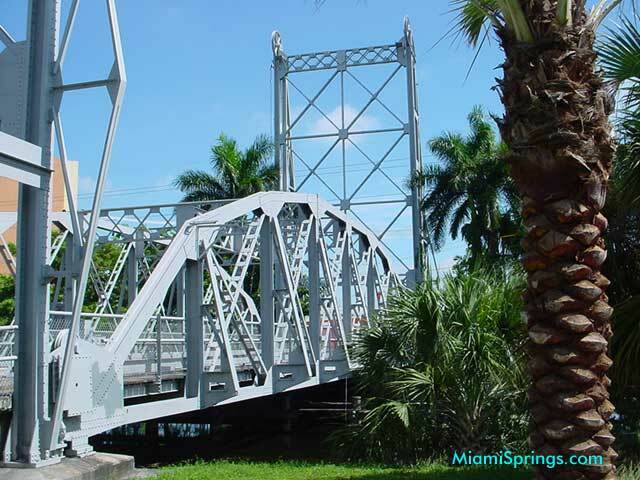 The two metal bridges are historic. They are iconic and beloved. Especially the vertical lift bridge. We love that bridge, too. We don’t want to see it go away, but we’d have to bury our heads in the sand to ignore that one of the options to improve traffic would be to get rid of the iconic vertical lift bridge for a plain concrete bridge similar to what we see on East Drive. We are not crazy about eliminating the vertical lift bridge. I think it’s too important and should be protected. But there’s no denying that a 4 lane bridge, as plane and ugly as it would be, would allow for double the amount of traffic to flow through each light cycle compared to the current 2 lane bridge. Putting a 4 lane bridge at Hook Square would decrease the traffic build up that goes up Hook Square, to the Circle, and backs up traffic on Curtiss Parkway and even Westward Drive. Furthermore, this solution hits the heart of the matter by increasing the current 2 lane bottle neck to a 4 lane bridge. Simple math. By increasing the lanes from 2 lanes to 4 lanes, you double the amount of vehicles that can flow through each light cycle. That would reduce the traffic build up by 50%. 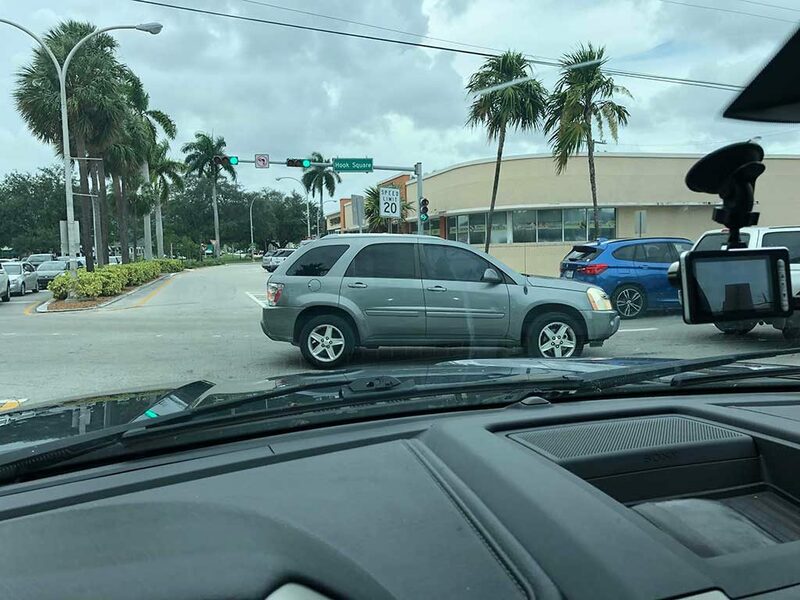 Ideally, you’d have a left turn only lane on the far left side. Two lanes that only allow you to move north onto east 1st avenue. 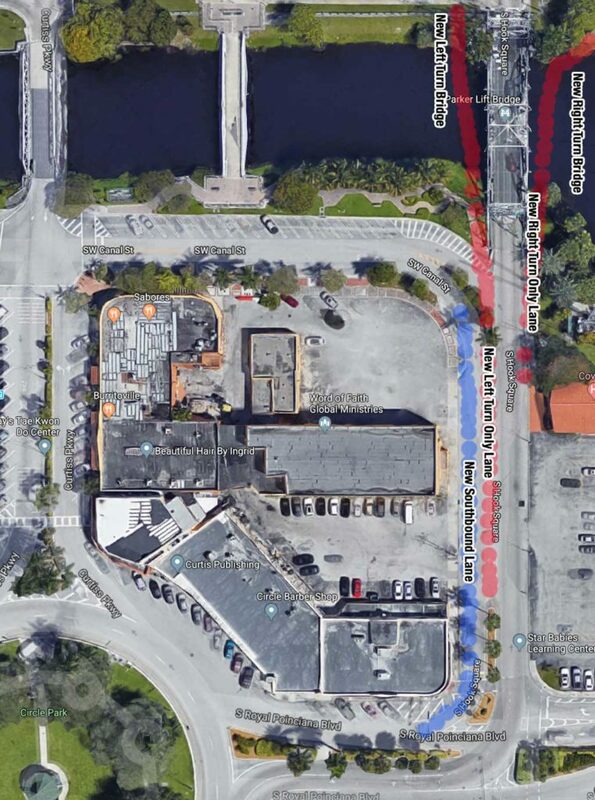 Plus, the far right lane would be a right turn only lane for those who want to drive east on Okeechobee. This option is the most radical concept, but it provides the practicality of a 4 lane bridge while retaining the beauty and history of our vertical lift bridge. This option would require construction of two additional bridges on each side of the vertical lift bridge. 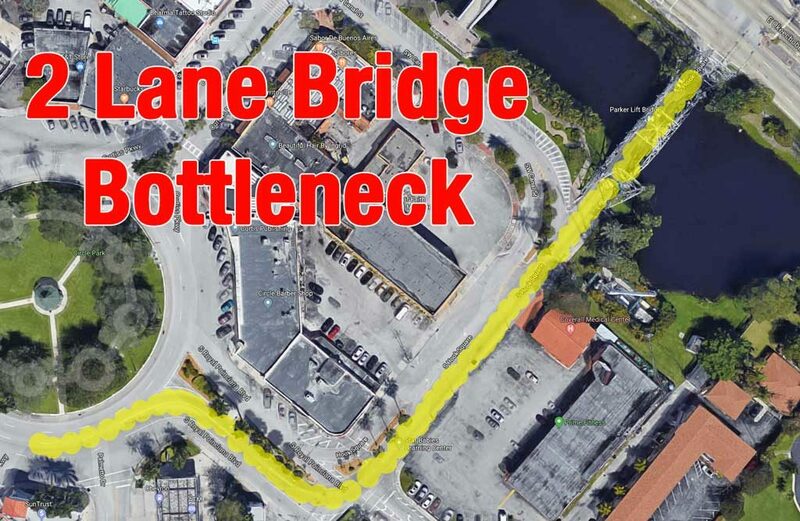 One bridge on the east (right side) would be a right turn only bridge for drivers seeking to head east on Okeechobee. On the west (left side) would be a left turn only bridge for those seeking to head west on Okeechobee. The two current lanes on the bridge would no longer allow any turning. These lanes would be for driving north onto east 1st avenue. This solution protects and preserves our historic vertical lift bridge while providing the much needed increase in traffic flow. Proposal to add a left turn only and right turn only bridges around the existing vertical lift bridge. 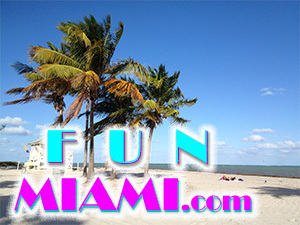 NOTE: The location of the bridges protects the existing 40 or 50 year old Royal Palm Trees on the north banks. 1 Southbound facing public parking lane. We recommend moving the current southbound lane west over the existing parking lane. This would provide space to expand Hook Square to 3 and eventually 4 northbound lanes. 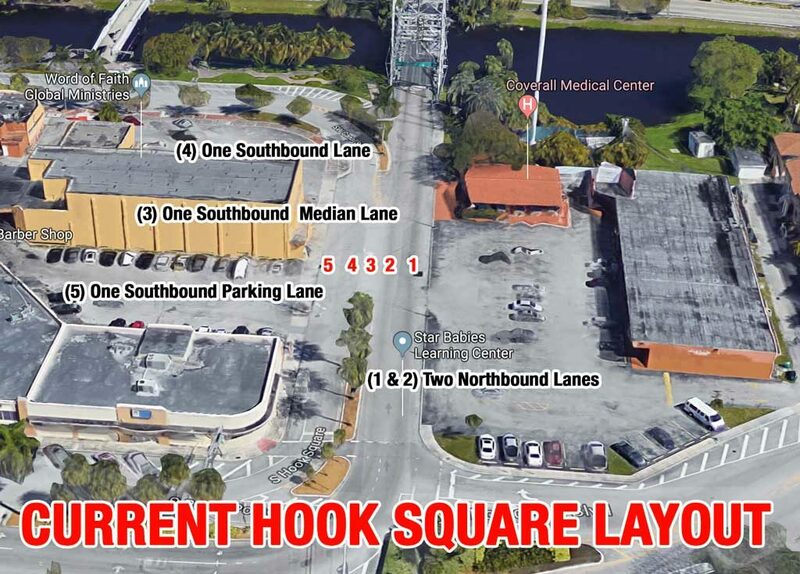 This will help move more vehicles that end up blocking the Circle and sometimes illegally blocking South Royal Poinciana Boulevard. I love our readers. 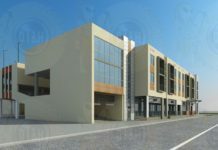 One reader privately submitted this option that removes the light at Hook Square. It adds 4 one way northbound lanes on Hook Square. It makes Canal Street One Way West. And it adds three left turn lanes to Hook Square. This idea also includes a right turn only bridge with a “Continuous Flow Merge Lane.” Plus, it also features a left turn only bridge on the west side. If you build it, they will come. More lanes of traffic won’t alleviate traffic, they’ll create the same amount. Less lanes of traffic won’t make more cars, there will be less. Equilibrium will be found no matter what is done. My suggestion is to ask FDOT to adjust the traffic lights on Okeechobee. An extra 15 seconds of flushing cars out of the circle might help and there is ZERO cost to try it out. Do we know how much of the traffic is from vehicles cutting through Miami Springs versus residents coming home or going to work (or employees in Miami Springs coming to work/going home)? 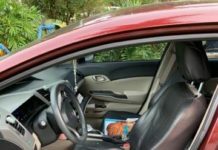 Police department has those handy license plate readers – no reason they can’t spit out some raw registration data that count the cars registered in Miami Springs versus not. Add speed bumps along Curtiss Pkwy…at golf cart crossings and every two blocks up till Circle. Place police officers during rush hr and be aggressive ticketing. This would serve as a deterrence and hopefully deflect the rush hr traffic to LeJuene rd or Milam Dairy Rd. I would also add speed bumps on East Drive, Westward Dr, and Ludlum. This would help with the increasing speeding problems on those roads. 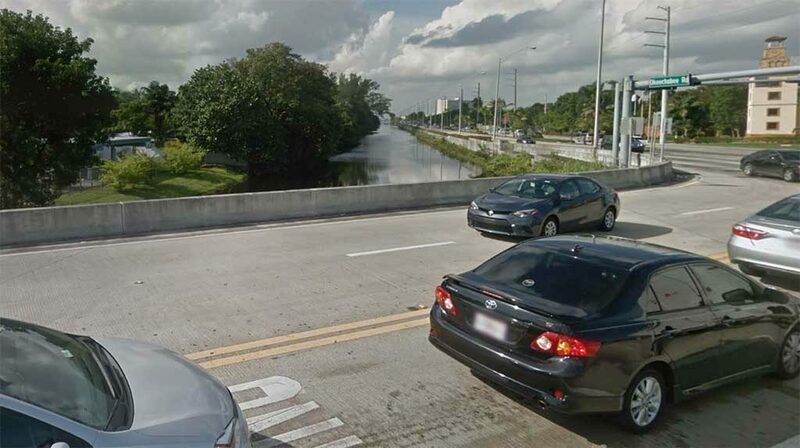 What if a bridge is built over by Red Rd in Hialeah (by the cat walk). Similar to the bridge on E 4th Ave by the Middle school. 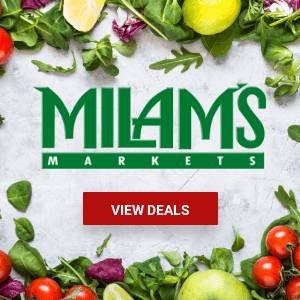 Incoming traffic from Hialeah would connect in MS on Dove Ave. Dove goes all the way to Ludlum (67th Ave) which goes to VG and commuters can then access 36 Street by the Boeing building. This is a community discussion. We want your thoughts. 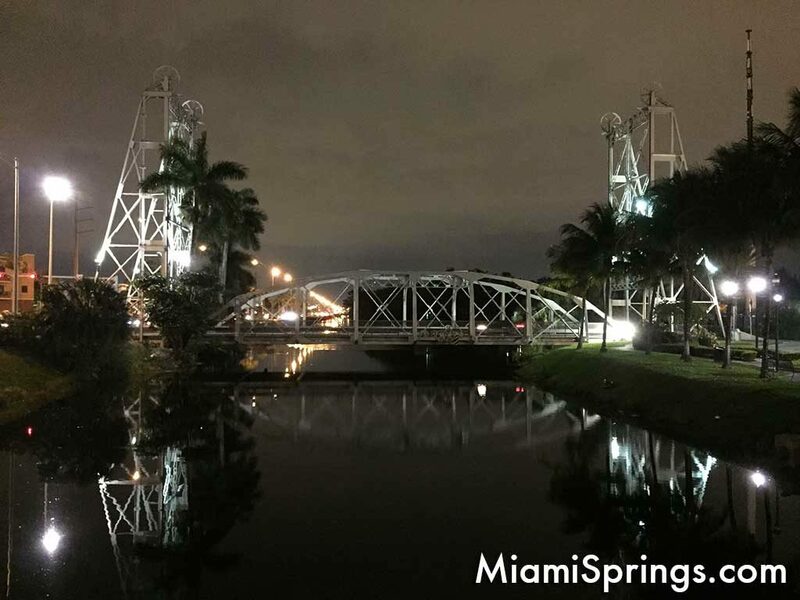 What do you think would best improve the traffic flow on the Miami Springs Circle? Leave your comments below or post on social media. 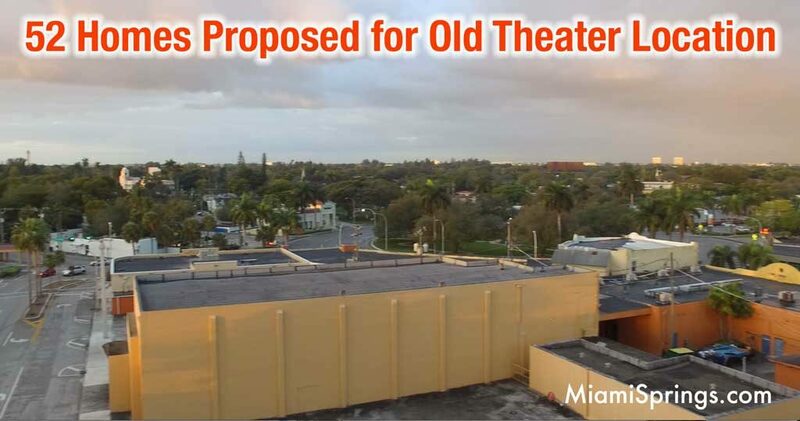 Then please share with your Miami Springs neighbors to get their input and feedback. 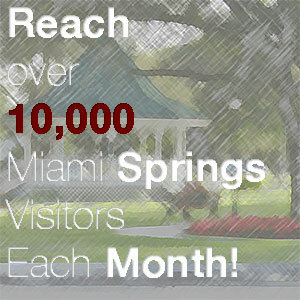 Together, we can improve traffic in Miami Springs.